Yerba mansa is a California native. 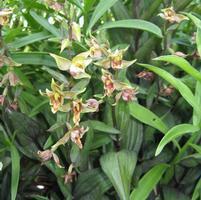 It has large bright green leaves and curious white flowers in early summer. It grows 6-8" tall and spreads by long runners in the same way as strawberry plants. 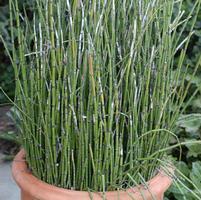 It prefers half a day of sun or light shade and does best in moist soil. Yerba mansa is a California native, occurring in Southern California along seeps, stream edges and wet meadows, particularly where the soil is alkaline. It has light green leaves which form rosettes of foliage about 6" tall. The plant spreads by sending out long runners in the same way as strawberries. In moist alkaline soils, large colonies of plants are soon formed. 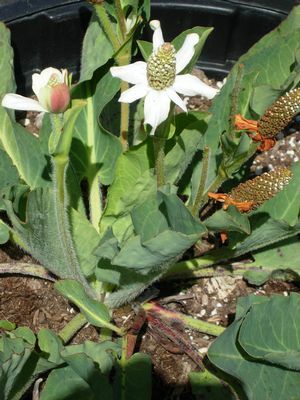 In late spring, curious cones of flowers are produced which stand about 3-4" above the foliage. Each "cone" is, in fact, a tight collection of masses of tiny greenish flowers. Although yerba mansa thrives in soils with a high pH, it's very tolerant of neutral and slightly acidic soils. It is also quite tolerant of infrequent watering and fairly dry soils, although it does look better with an ample supply of water. 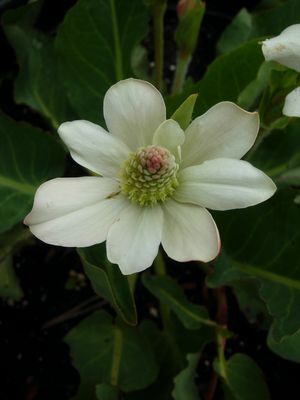 Yerba mansa is tolerant of full sun in cool coastal conditions. However, it prefers light shade. Yerba mansa will probably survive occasional winter temperatures down to 20°F. In the nursery, it has survived twelve consecutive nights of 22°F. Yerba mansa works well in seasonal containers with other moisture-loving plants such as horsetail, gray rush (Juncus patens) and seep monkey flower (Mimulus guttatus). It also works well as a marginal plant alongside water features.